(Broomfield, Colorado) – June 23, 2017 – Phonesuite, a leading provider of communications solutions for the hotel industry for more than 25 years, today unveiled a new branding initiative that encompasses both the company’s outstanding reputation and tradition of excellence, as well as the innovation and focus on the future that will continue to drive hotel communications to answer operational objectives and elevate guest relationships. Phonesuite’s new logo signifies the advanced, flexible and feature-rich products the company provides to hotels in every category, while the improved website will deliver a fresh creative look, modern platform, responsive web design and intuitive navigation. The new Phonesuite website has been launched and is live now at www.phonesuite.com to signal the innovative new products and features that will be available to demo at Phonesuite’s HITEC 2017 booth #1319 June 26-29, such as Mobile Integration, Voiceware Browser-Based Console and the new Exceptional Service Call Center ACD offerings. The website will provide thorough information on the breadth of offerings Phonesuite has developed to serve the needs of hotels across all major brands, sizes (50 rooms to 2,000+ rooms) and service types (Select, Full-Service, Boutique, Luxury) and prove a valuable resource for visitors who will easily be able to access a wealth of forward-looking industry thought leadership. 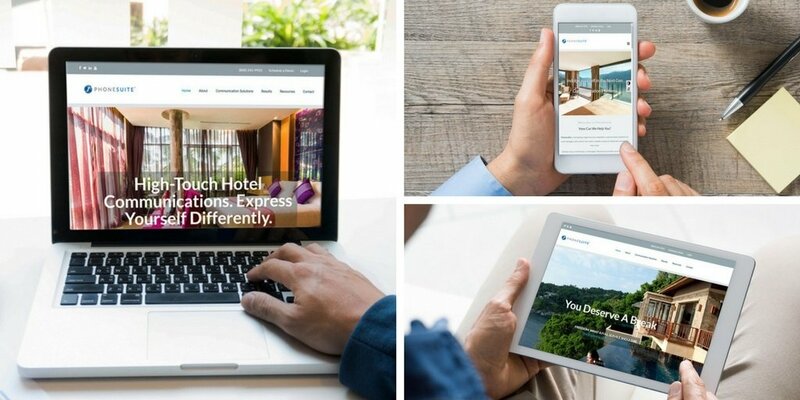 The website transformation will mirror Phonesuite’s ability to shape the way hospitality views communication through innovation, superior customer satisfaction and evergreen communication solutions.